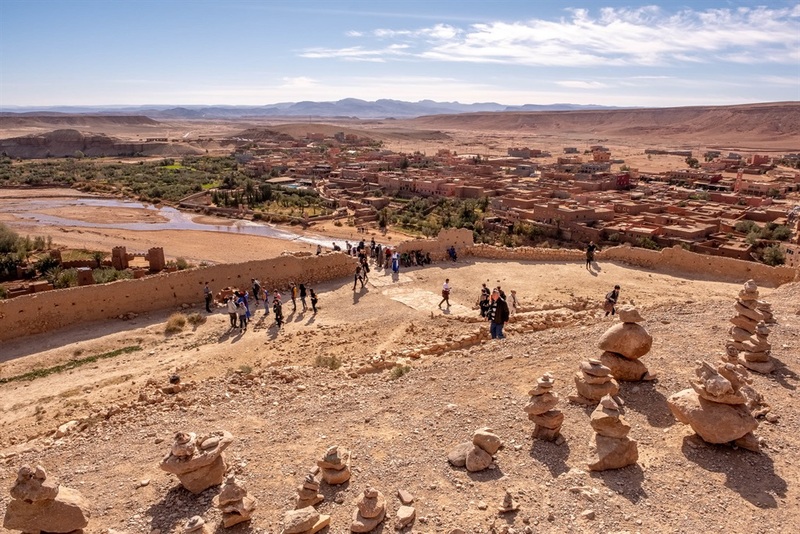 It's immediately clear why so many movies are filmed in Ait Benhaddou when you visit. 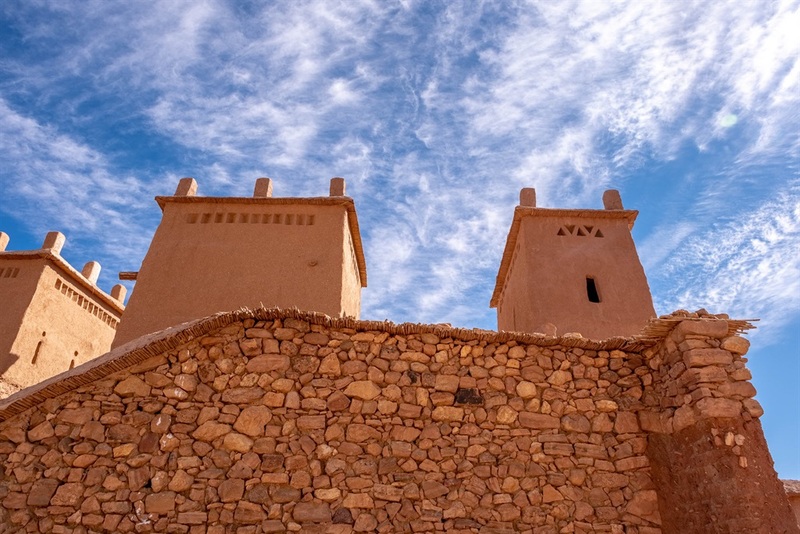 The medieval ksar of Aït Benhaddou is a gorgeous tiny town in southwestern Morocco and a UNESCO World Heritage Site. 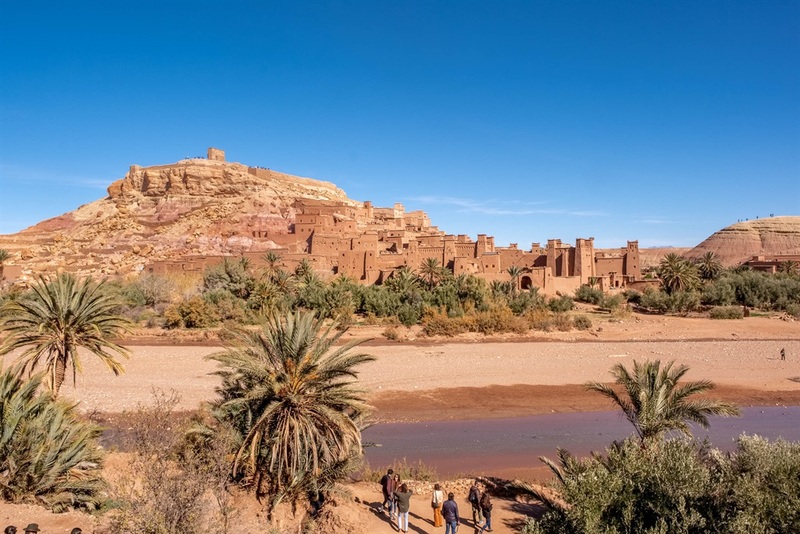 Located in a stunning red desert landscape, Aït Benhaddou is a frequent filming location for historical and epic movies like "The Mummy," "Gladiator," "Alexander," "Prince of Persia," "Kingdom of Heaven," and, most recently, "Game of Thrones." I recently visited. While it doesn't rival ancient archeological sites in places like Greece or Egypt, it is a stunning sight in its own right. It's a strange phenomenon that locations that are historical and famous in their own right sometimes become more famous for the fictional things that happen there. On my first trip to Philadelphia, I recall joking with my parents that Independence Hall is famously where Nicholas Cage's "National Treasure" character Benjamin Gates discovers a pair of glasses "made by" Benjamin Franklin, rather than where The Declaration of Independence was signed. "Indiana Jones and the Last Crusade" is half the reason I was so excited to visit the ancient city of Petra last year. 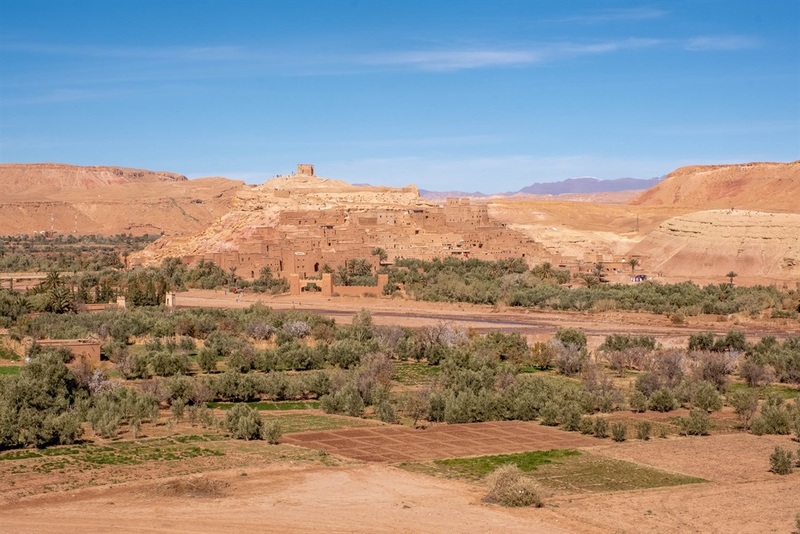 But that doesn't make a place like Aït Benhaddou any less awe-inspiring. 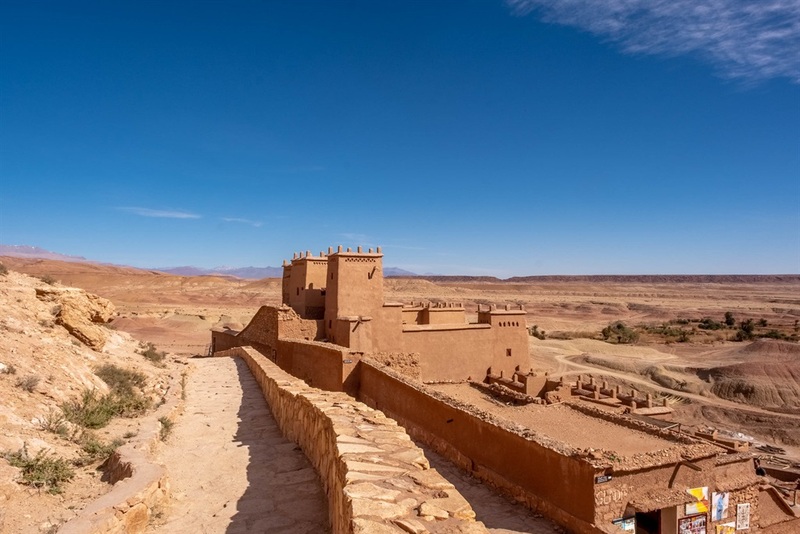 Named a UNESCO World Heritage Site in 1987, the mud-brick structures of Aït Benhaddou date back to the 1700s and are an impressive example of Moroccan architecture. 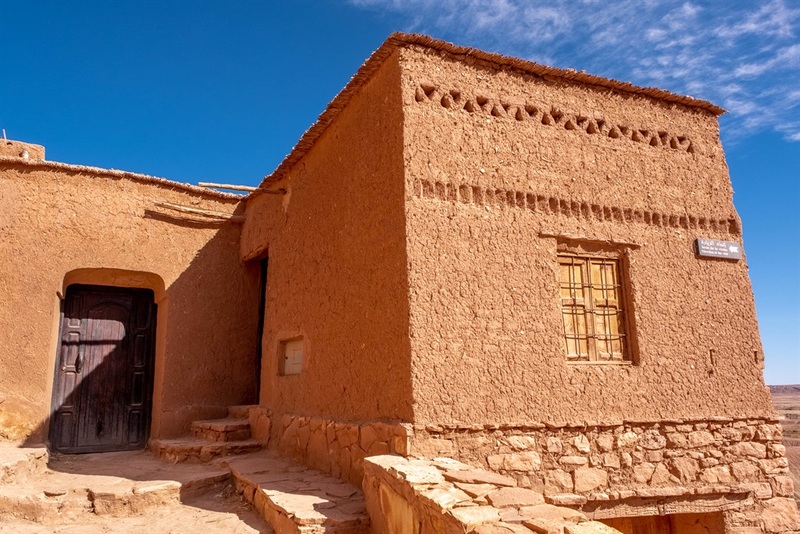 ... then you've seen the medieval ksar of Aït Benhaddou. You may just not have known it. 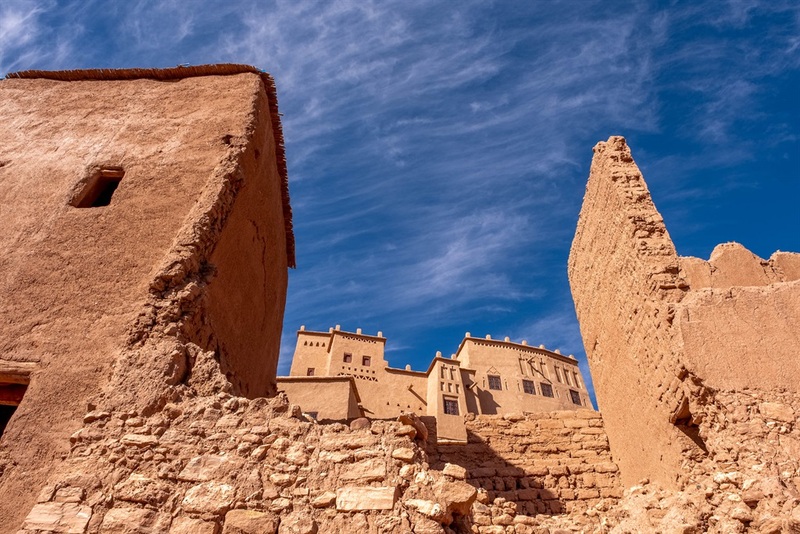 A few hours from Marrakech in southwestern Morocco, the fortified town is one of the premier sights in the country. That's it in the distance. 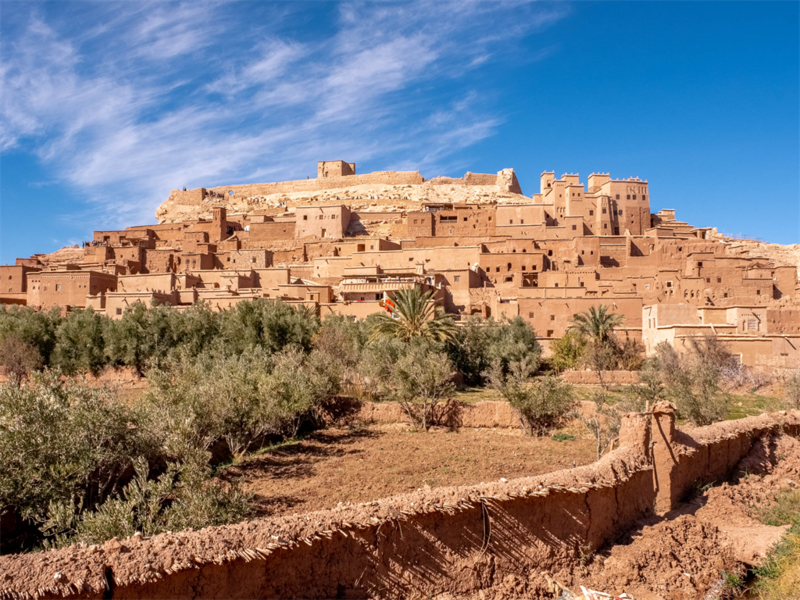 On a recent road trip from Marrakech to Fez, I decided to stop in Aït Benhaddou to have a look around. 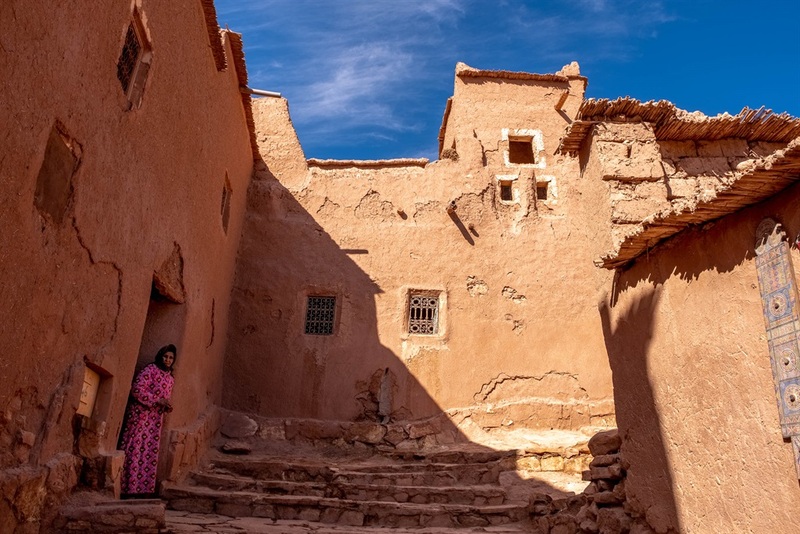 The town is a ksar, a North African term for a fortified town inhabited by Berbers, the indigenous population. 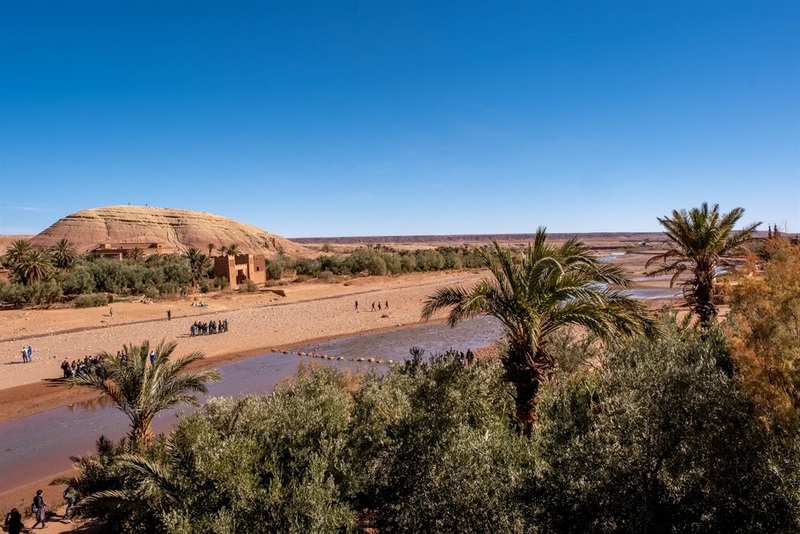 Like many ksars, Aït Benhaddou is built along a water source, the Ounila River, which sprouts palm trees and other desert vegetation along its banks. 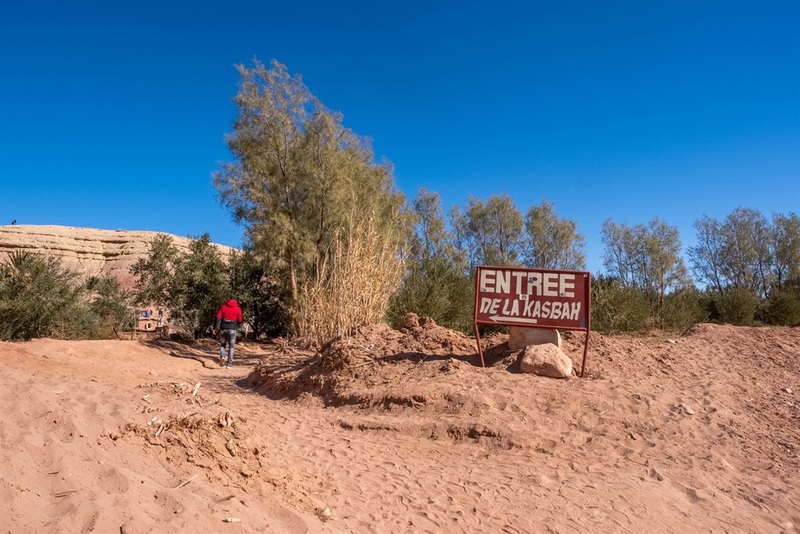 To get to the ksar, you have to cross the river. 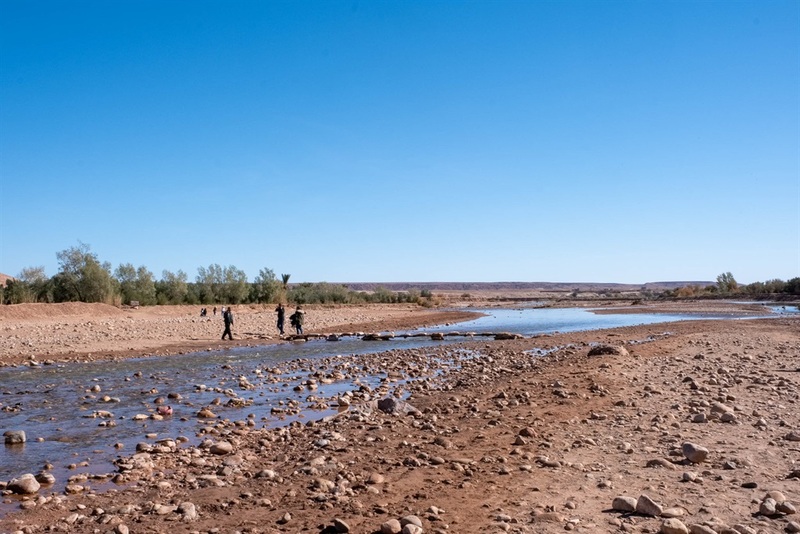 But most of the river was dried up when I visited in January, so it wasn't too difficult. There are some helpful stepping stones set up as a makeshift bridge to help you get across. 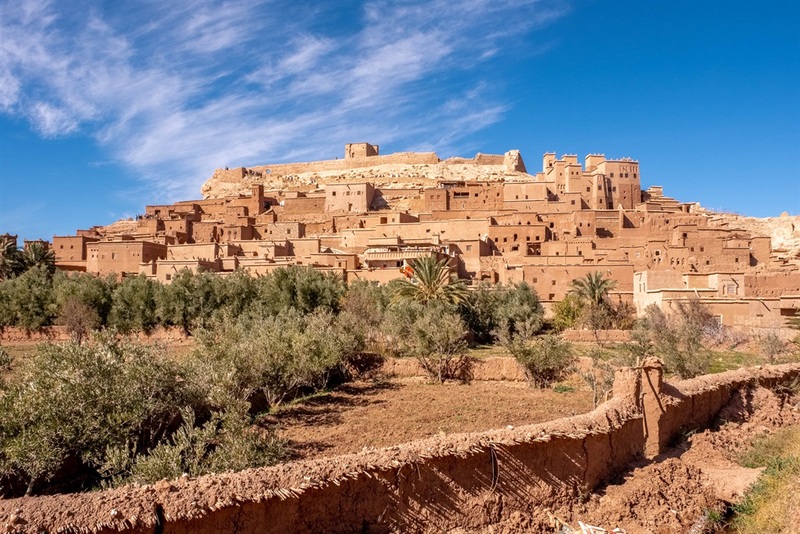 There are dozens of ksour (the plural of ksar) throughout Morocco, Tunisia, and Algeria. 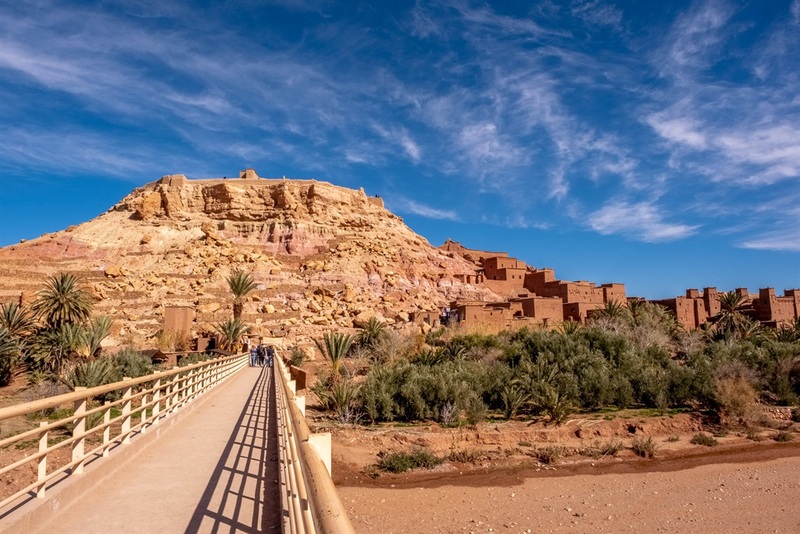 But Aït Benhaddou is one of the biggest and most impressive. 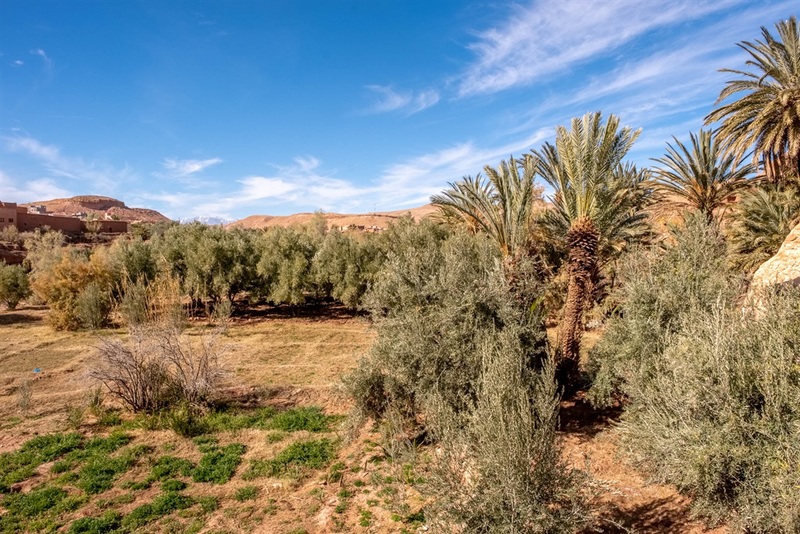 Outside the fortified town lie fields for growing crops like grains that can survive in the arid desert climate. 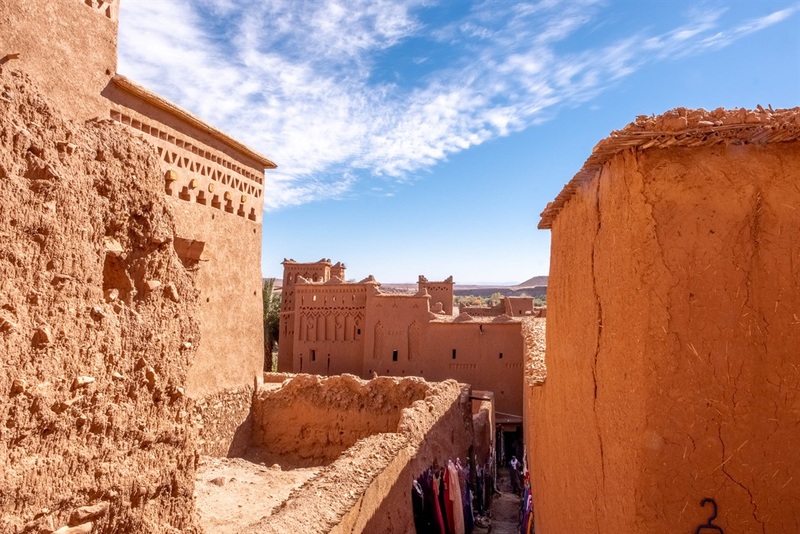 Locals believe that Aït Benhaddou was founded in 757 C.E. 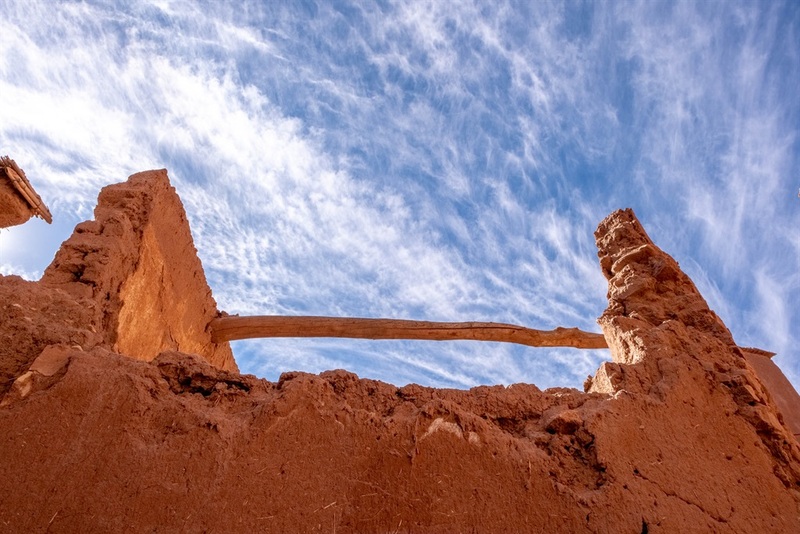 by Ben-Haddou, whose tomb is supposedly behind the city. But historians say its unlikely any of the buildings in the city are older than the 1700s. 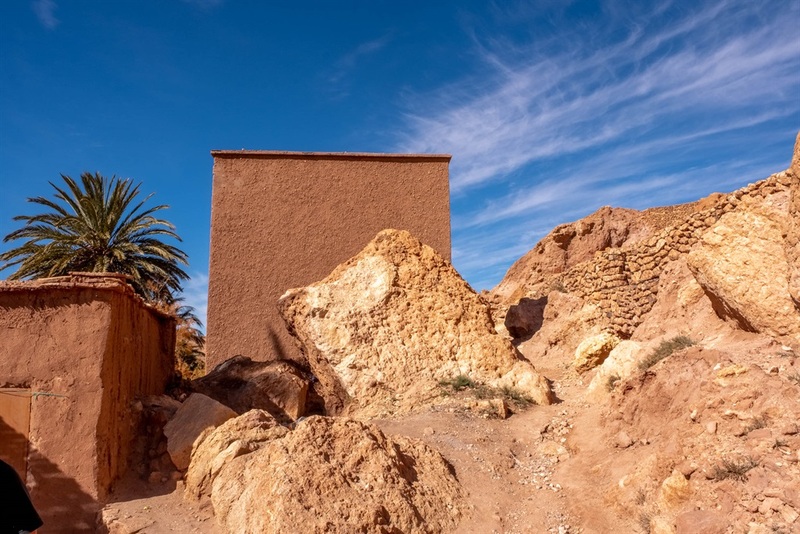 The structures are typically made of local raw materials that are compacted in a process called "rammed earth." 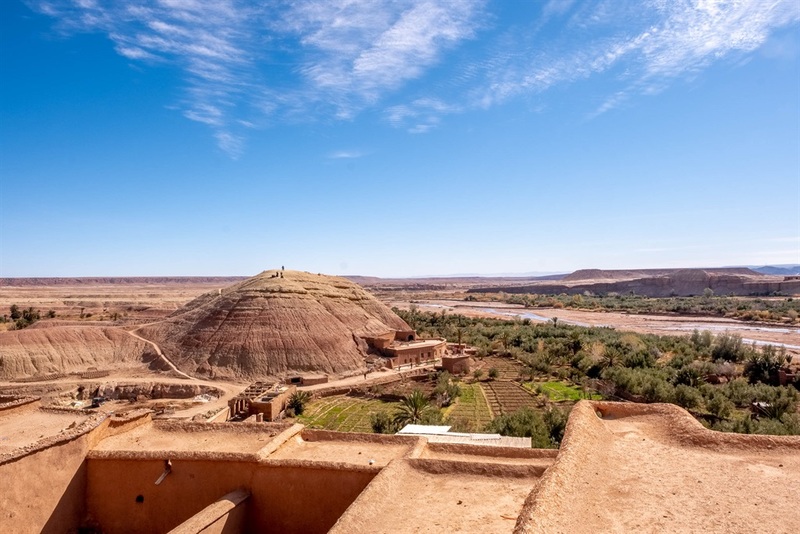 Aït Benhaddou is made from the reddish mud-clay of the riverbanks. 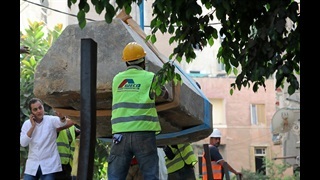 While the building technique is low-cost, strong, and durable, it requires constant upkeep and restoration. Rains will often damage the structures. 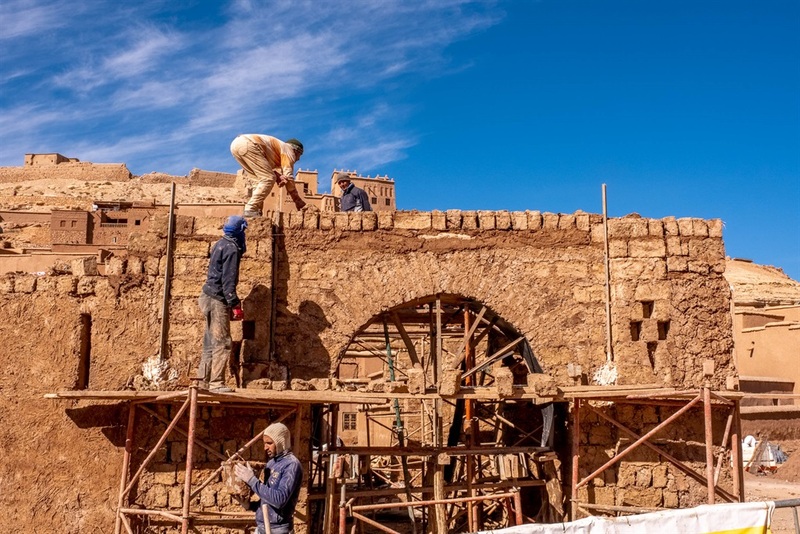 These days, restoration efforts are usually overseen by UNESCO, which named it a World Heritage Site in 1987. You can see the raw materials the restoration teams are using to fix the structures here. Note the straw and mud-clay. 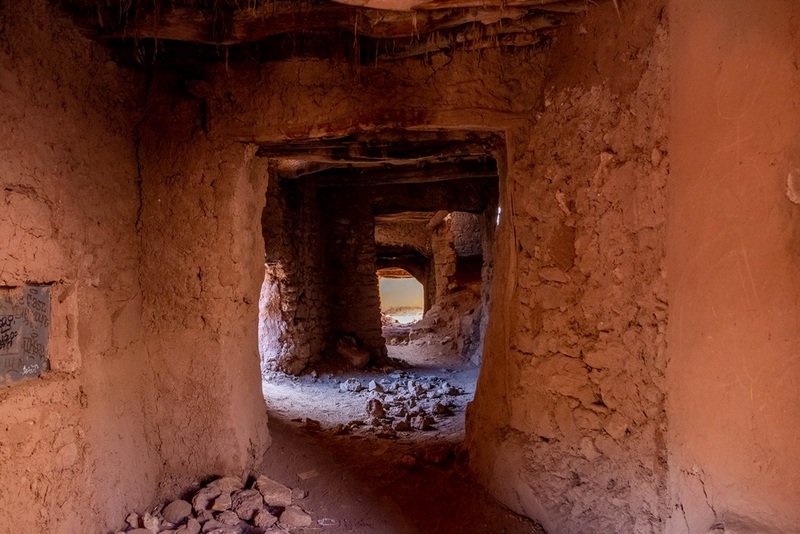 Without upkeep, a ksar can be destroyed in as little as 20 years. 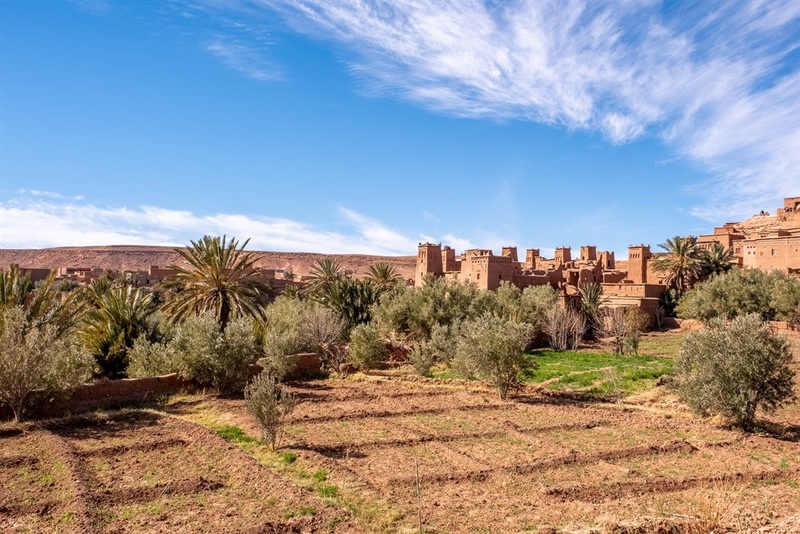 Like almost all ksour, Aït Benhaddou is made up of a few basic elements. 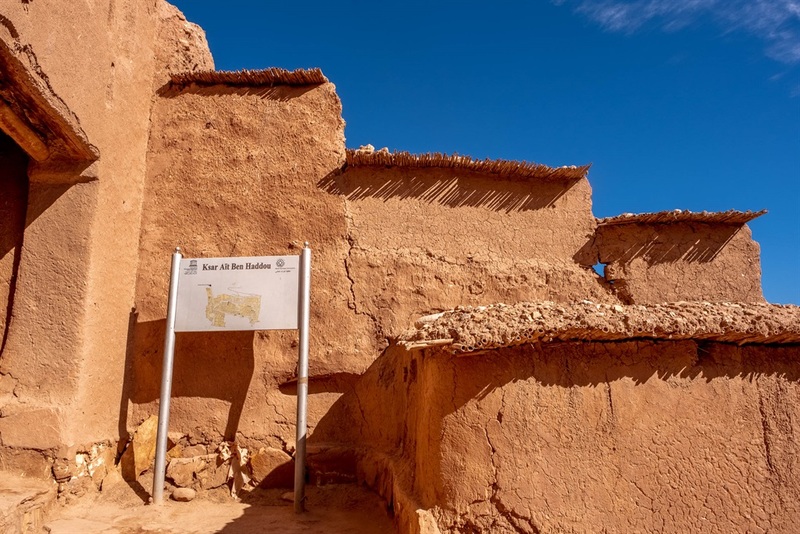 There is a series of houses where local Berber families live. The houses are surrounded by very high walls to protect them from attacks by other populations. Then there are a number of public structures. There's a caravanserai, a local inn where weary travelers can rest for a day or two after long travel. Then there are stables, like these, for locals' and travelers' animals. 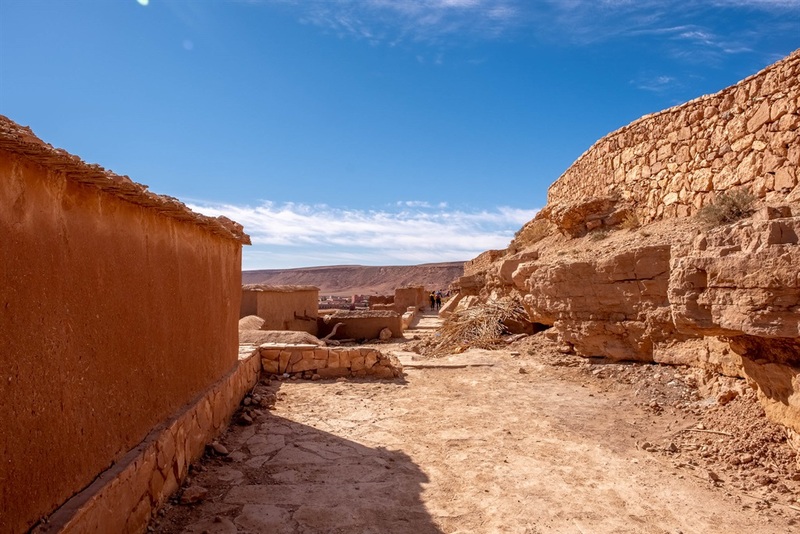 As Aït Benhaddou is such a popular tourist attraction and filming location, it's not completely in-use anymore, but there are plenty of other ksour scattered in Morocco that are. 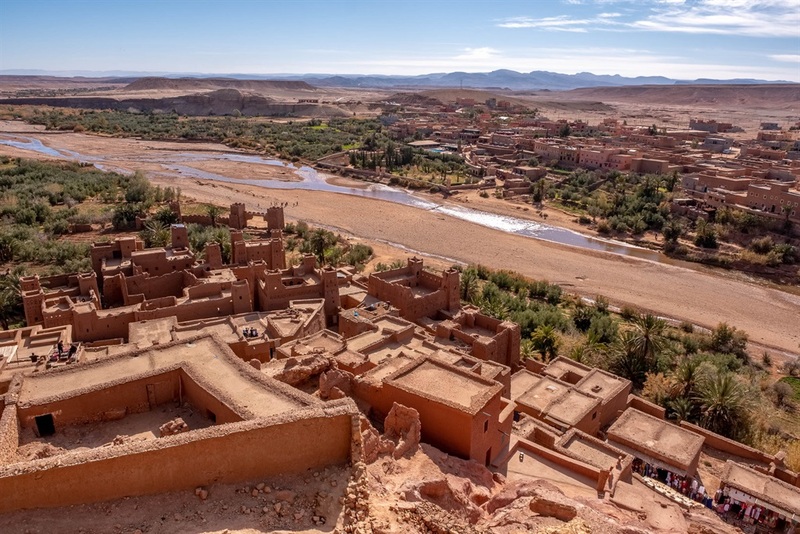 Aït Benhaddou lies along a major North African trade route that in the past carried gold, silver, spices, and, unfortunately, slaves from Sudan and east Africa through the Sahara to Europe. ... and a mosque, though I had trouble locating it. 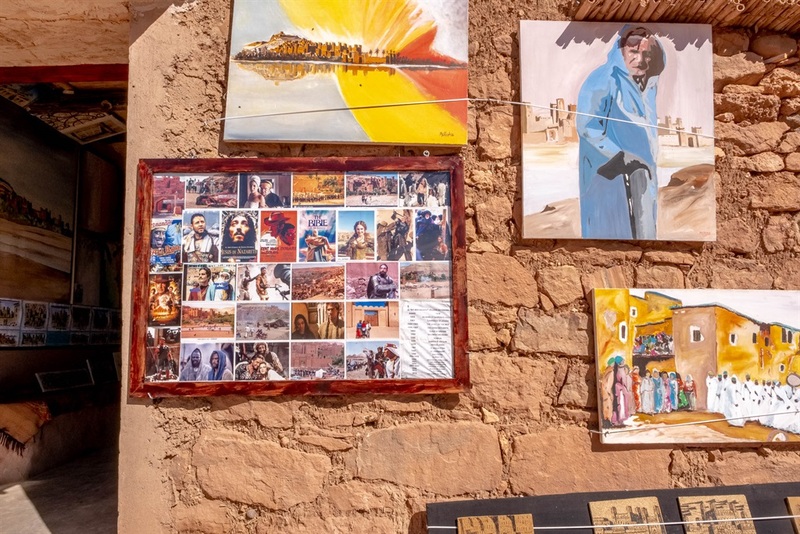 One of the shops had a plaque listing all of the movies that had been filmed in Aït Benhaddou. It's a point of pride among the locals (as well as a source of income). 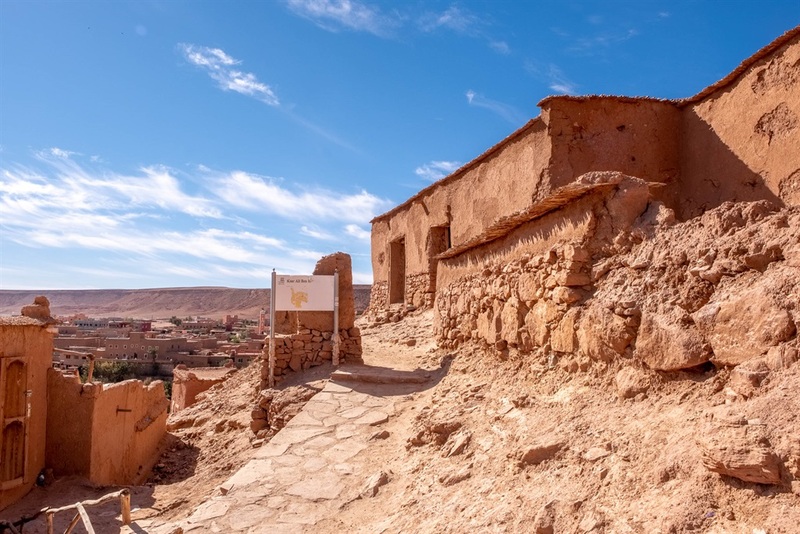 Ksour like Aït Benhaddou arose out of locals taking advantage of an opportunity. 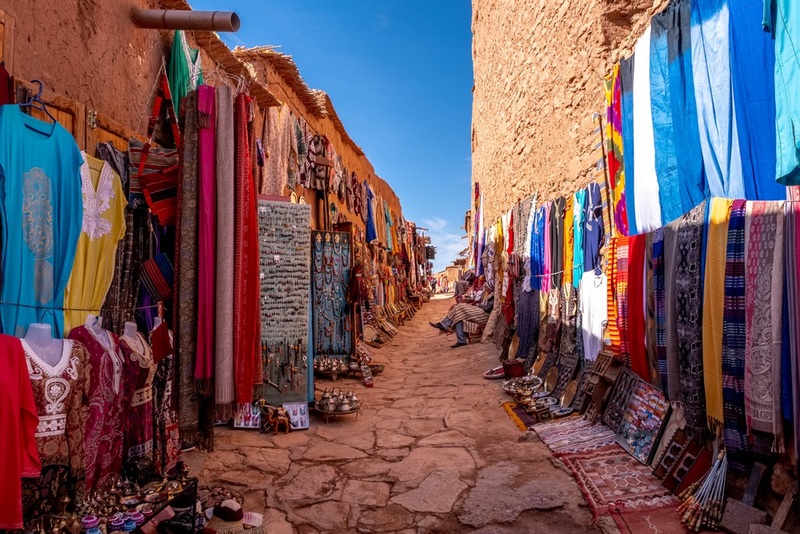 With so much traffic along the Trans-Saharan trade routes, traditionally nomadic Berbers decided to settle and earn a living by providing shelter and food to traveling merchants. The great value of the trade goods that passed through their towns, however, would have made the ksour targets for thieves and attackers. 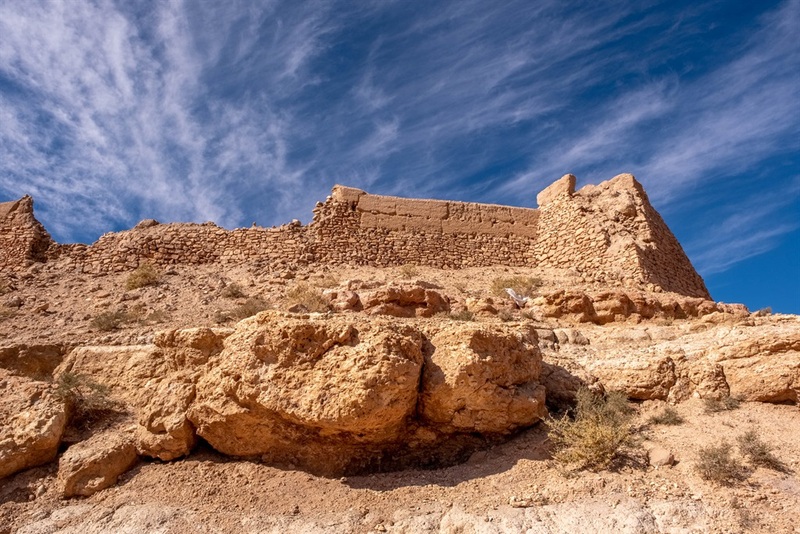 The ksar's high walls and defensive structures protected the locals and the goods. 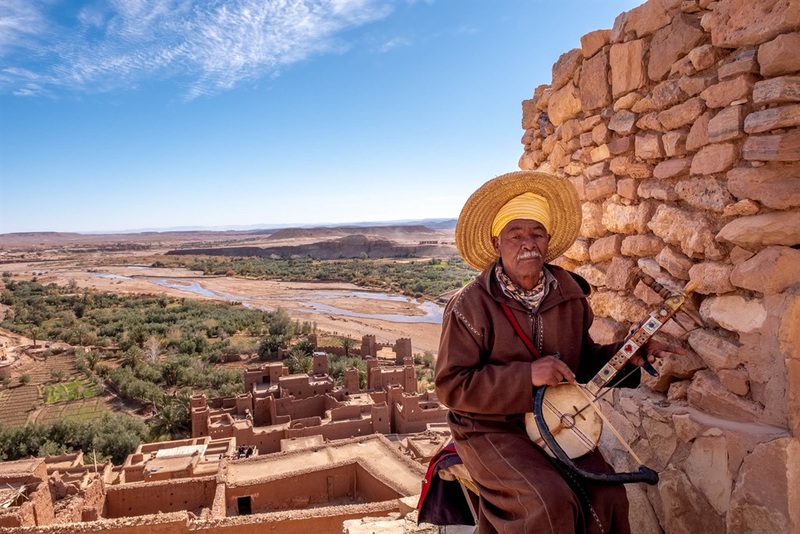 These days, locals make a living primarily by guiding, playing music, or selling goods to the tourists who pass through. 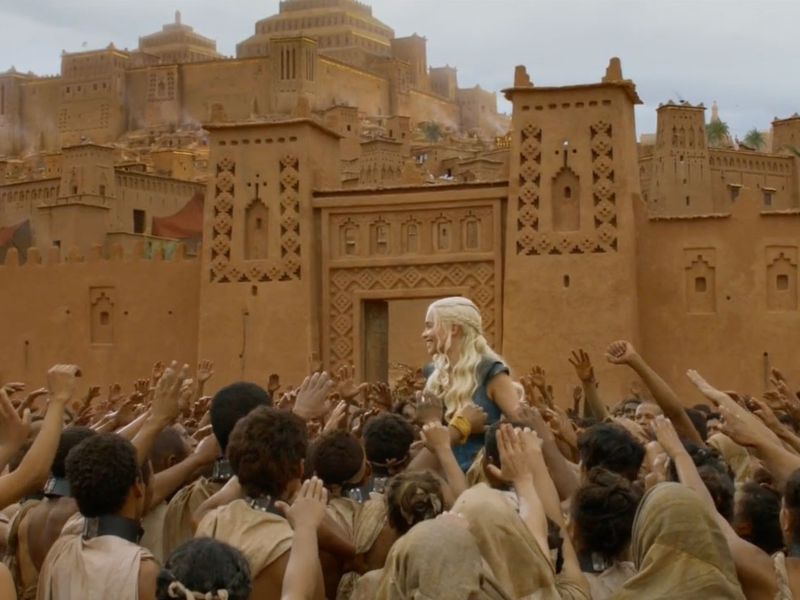 Some do work as extras in the films, but most extras come from nearby Ourzarzate. 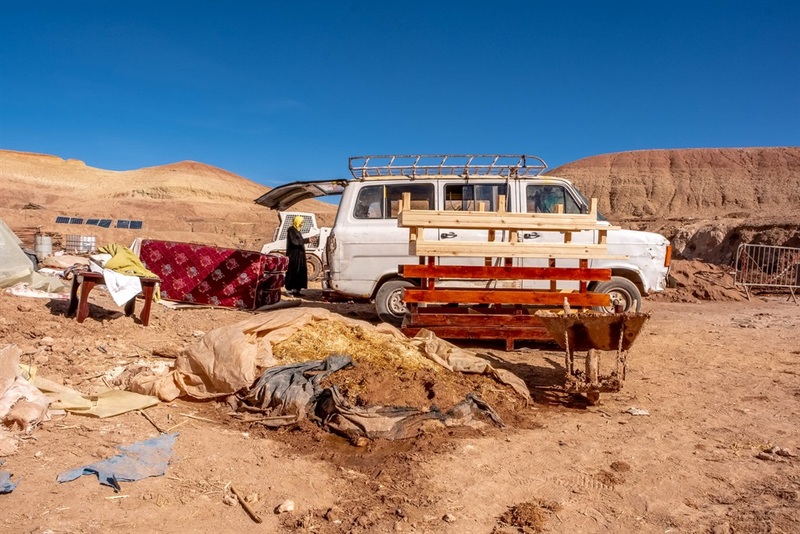 The locals have also moved out of the ksar to the more modern town on the other side of the river, which is closer to the road. 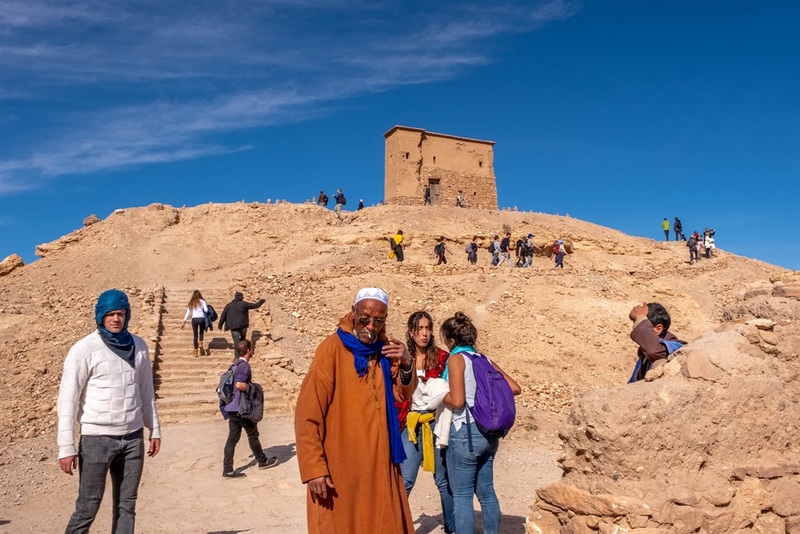 The ksar is mostly just a tourist attraction. 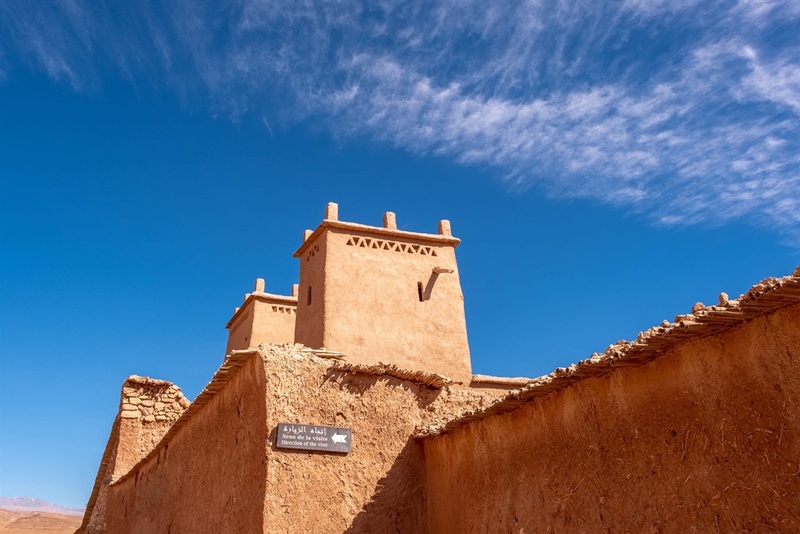 Aït Benhaddou is built into a hill with defensive walls placed periodically as you go up, thus adding another layer of defense for its inhabitants. 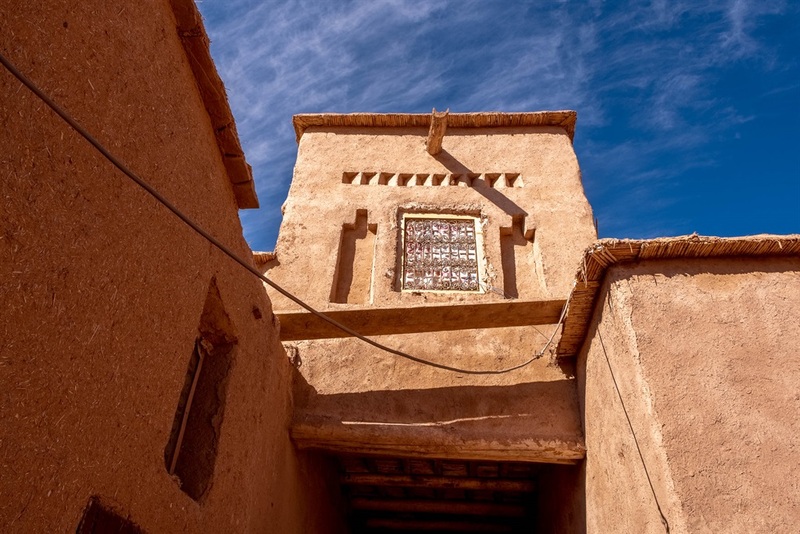 If invaders were to get into the ksar, inhabitants could retreat higher and higher up the walls. 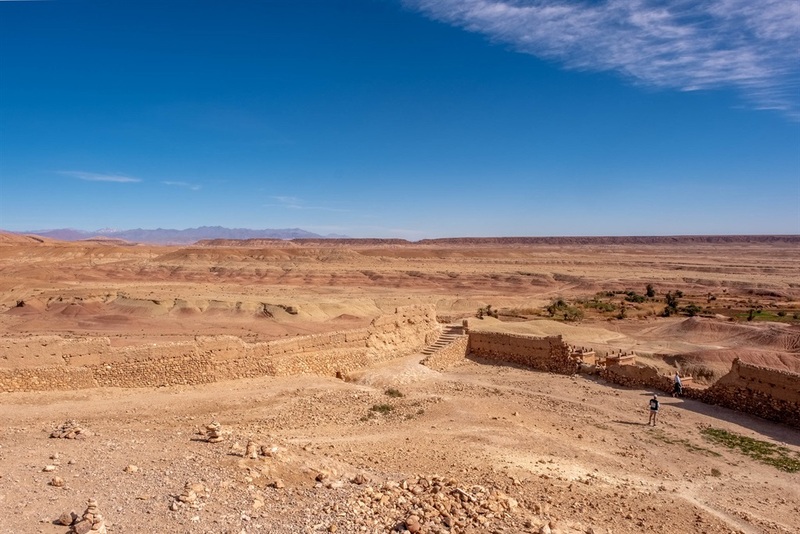 At the very top of the ksar is a fortress that inhabitants could retreat to as a last resort. ... as well as the surrounding river and towns. ... and winding staircases, two more lines of defense. 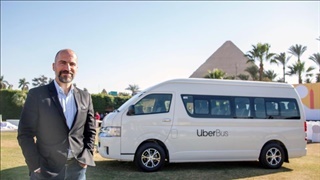 It's difficult to sack a city when you don't know how to navigate it. 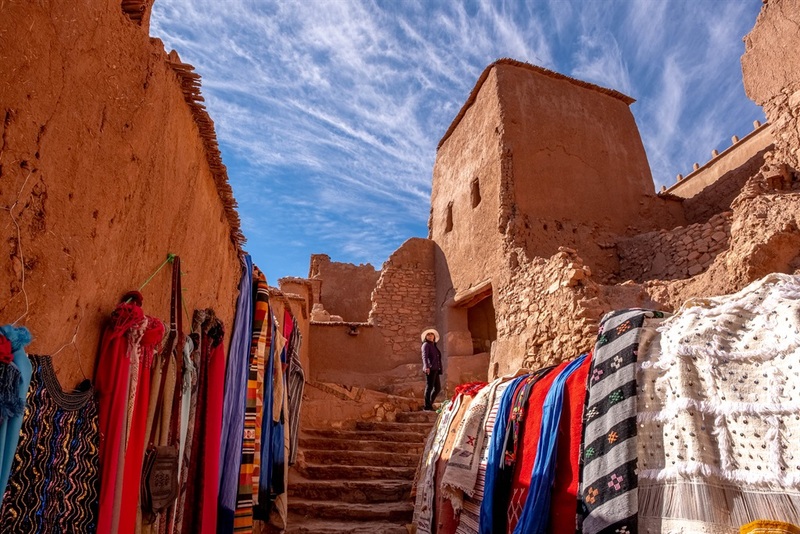 Locals have set up a small market that sells handmade scarves, jewelry, and djellabas, or traditional Berber robes. But mostly, I was just there to admire the architecture. ... and the varied desert vegetation. 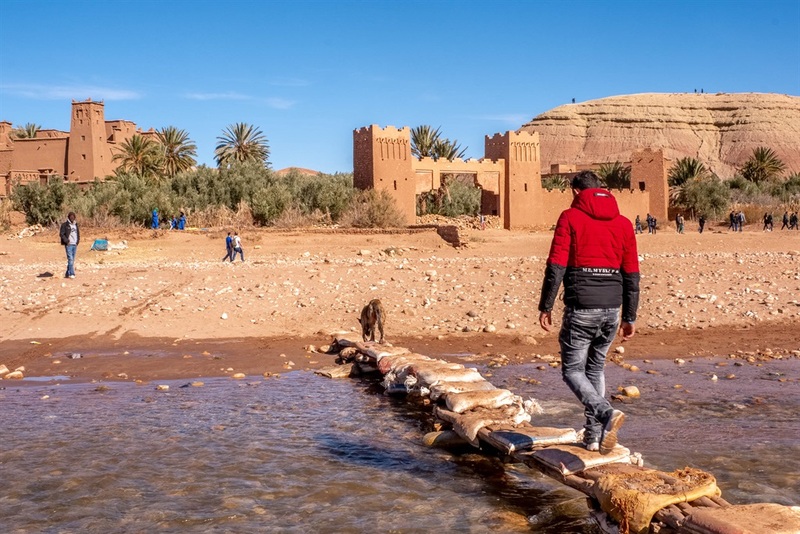 I took one last look at the ksar and headed out across a more modern bridge. 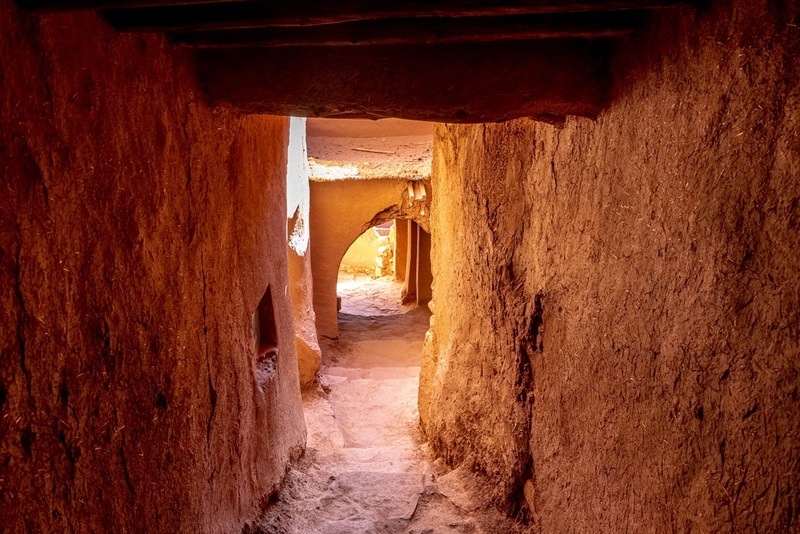 Some people stay for days in and around the ksar exploring the landscape and the town's every nook and cranny. 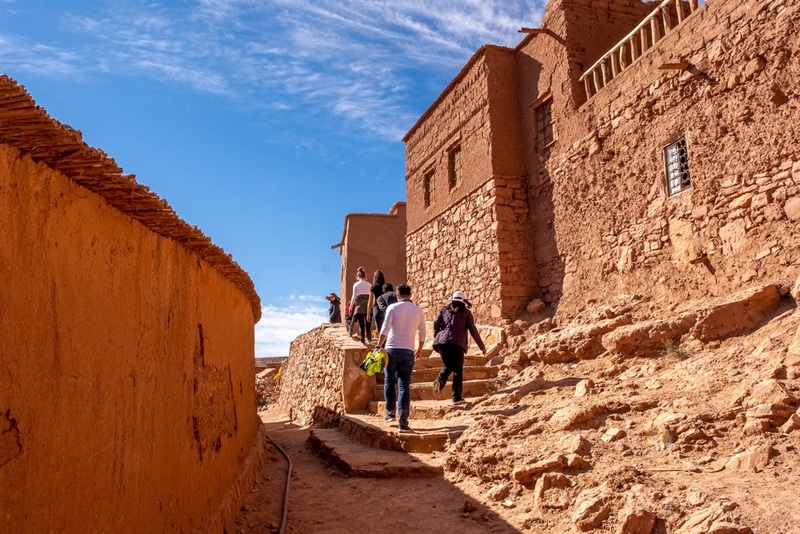 While Aït Benhaddou makes for a stunning vista, all you need are a couple of hours to explore the town, in my opinion.